Paralympian Alana Ramsay found her freedom on the ski hill when she was just six years old, after having a stroke. Her physiotherapist at the Alberta Children’s Hospital recommended she reach out to the Calgary Association for Disabled Skiing (CADS) to get her involved in sports. “I have cerebral palsy on my right side,” Ramsay says. “I had a stroke, prenatal, right behind my left eye. Ramsay went to CADS to ski every Friday night as a young girl. She credits the program for kick-starting her career as a Paralympian. Eventually, she went on to compete in the 2018 Paralympic Winter Games in Pyongyang, where she earned two bronze medals. “I’ve always seen my ability, not my disability,” Ramsay says. CADS is a volunteer-based organization at Canada Olympic Park with approximately 500 members. 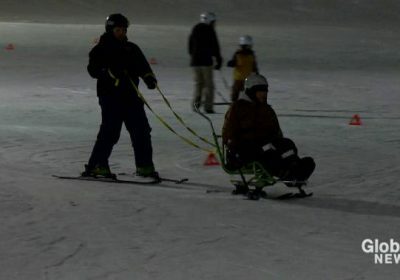 Their volunteer instructors teach people with disabilities how to ski or snowboard using adaptive skills and equipment tailored to their needs. “The biggest reward is seeing the smiles on every participant’s face as they learn a skill and a sport they never thought they would be able to — either skiing or snowboarding,” says Tori Harrison, a CADS instructor. Dale Ohler never thought he’d feel the rush of speeding down the slopes again, until he started taking skiing lessons with CADS on Sunday nights. He’s in a wheelchair now but his abilities to adapt have never wavered. CADS volunteers are the helping hands, so there’s no limitations for someone with a disability. It’s about what they “can” do. “It was a huge learning curve,” Ohler says. “The first year was really scary but once I caught on to it and stuff, and these guys are so good with helping me, it was just excellent. Lifting me in and out of the chair and stuff. CADS is holding its annual Movement Gala on April 11. The event is aimed at raising awareness and funds for CADS. The money is used for a number of initiatives, including to purchase adaptive equipment and to subsidize the lesson costs to students.